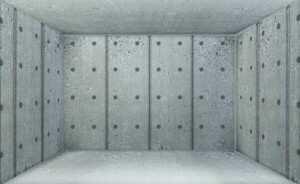 The slaps(verbal/physical) are like slabs of concrete that a student piles up when they are in distress(feeling helpless, unheard, confused, frustrated, angry, trapped, hurt, and _________). 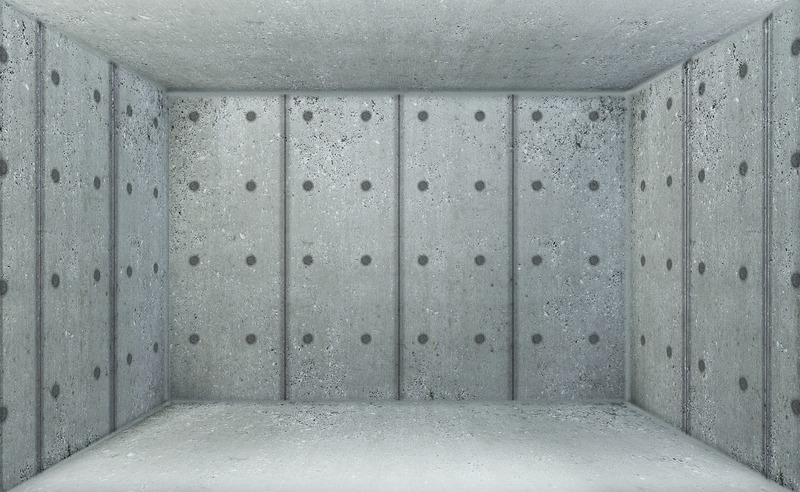 Our students are using these slabs to construct walls which will insulate and protect them from what they feel are are real threats to their wellbeing, happiness, and safety. All the while, staff are working tirelessly to keep them from walling off completely to the point of hurting themselves or others because the ability for flight has left, and the fight is on…again. It has been happening a lot more frequently in our classrooms and it knows no age limit as educators are experiencing violence from JK to 12. Has it happened to you? How about to someone in your school? A 2016/17 survey of elementary teachers showed that 70% of them had experienced or witnessed violence in their schools. That distills down to an average of 7 in 10 educators are on the frontlines of a serious problem. No one wants to work where threats and acts of violence are now daily bi-products of their job? Yet, that’s what many teachers are facing as they enter the classroom each day. Even with NVCI, CPI, SERT, CYW, EA, IBT, BHS, and Social Work support in the building or available from regional teams, incidents are increasing in number and intensity. Students are taking out their frustration, anger, and anxiety in physical ways directed towards school staff. More than ever, it is being documented and reported more across all age panels. So what’s happening inside our schools where once seemingly uncommon incidents are now daily occurences? All of this cannot simply be dismissed as statistical anomalies. Before you get hurt, or hurt again. Each time a student slaps, bites, kicks, target throws, pushes, strikes with an object etc. a report must be made. If you are injured, seek medical help first. Make sure you tell someone (union rep, admin, a colleague). 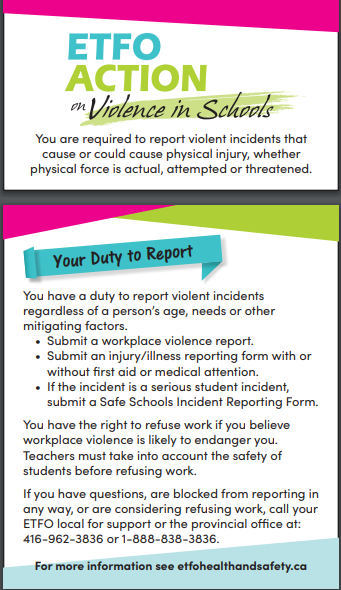 See the graphic below to make sure you are protected as you have the right to refuse work when you believe workplace violence is likely to endanger you. If you are hurt, it is not the time to play through pain or put on a hero cape. It is your health and well being that must be protected. No one should go to work expecting to be hurt on the job. If you need help, call your union rep or a colleague. Let your voice be heard. Our schools cannot be left under-supported with an expectation to educate our students in the face of increasing violence and increasingly complex behavioural needs? Our schools need supports in place to ensure safety for all and that includes you. I will leave you with this final question. How have spaces of nurture, growth, hope, and community also become places of anxiety, stress, harm, and PTSD for both teachers and students? How are you managing in your school? Please keep the conversation going. Our notifications, news outlets, and social media feeds are filled with stories, images, and video sharing what’s happening. As I draft this post. CBC News shared a disturbing news story that surfaced online involving a teacher being assaulted by several students in Toronto. Read more about how ETFO has been lobbying our government to address the issues of violence in our schools.